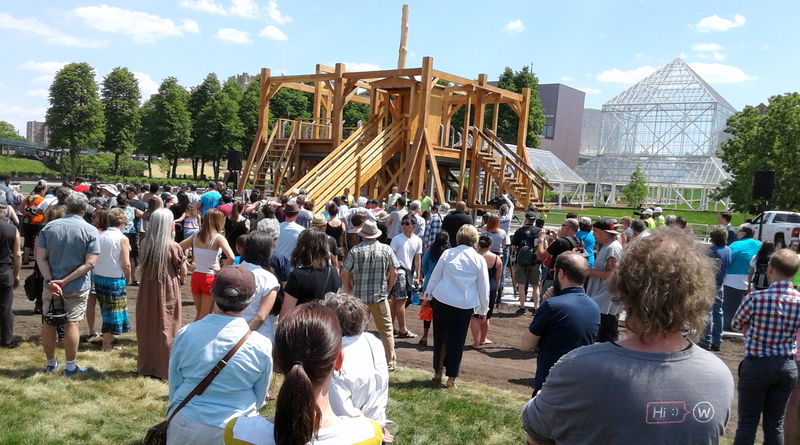 A crowd gathered at the Walker Sculpture Garden for a Dakota healing ceremony. The event began outside the temporary chain link fence surrounding the Sculpture Garden. Speakers included Art Owen of the Prairie Island Dakota Community and Sheldon Wolfchild of the Lower Sioux Indian Community. 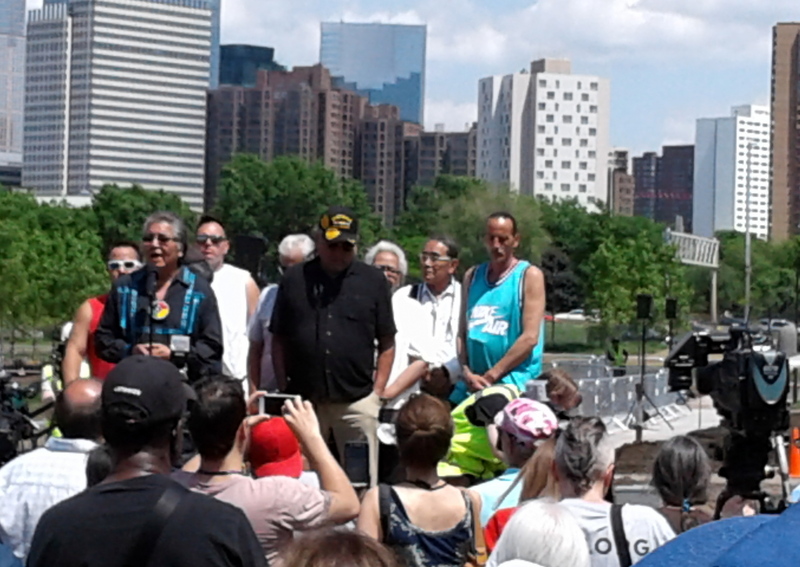 Art Owen (Prairie Island) and Sheldon Wolfchild (Lower Sioux) spoke before the ceremony. Scaffold was to be part of the upcoming Grand Reopening of the Sculpture Garden, but it was quickly engulfed in controversy. The artwork depicts several historic gallows, most prominently the gallows used to hang 38 Dakota men in Mankato in 1862. It was the largest mass execution in U.S. history. Neither the artist nor the Walker thought to ask Dakota people for their reaction. When the sculpture started going up, that reaction came fast. The Walker and the artist Sam Durant have both issued public apologies for not being aware of how this would affect the Dakota community. Stephanie Hope Smith, the neutral mediator in this process, gave a brief update, saying today’s ceremony would be the last “media moment” at the Walker related to Scaffold. “This is closure,” she said. Wolfchild talks about In-Yan Sa. In-Yan Sa, the sacred red rock of the Dakota people should be moved to Wakan Tipi (also known as Carver’s Cave), one of the Dakota people’s sacred sites, Dakota elders say. The elders gave a positive response, and backed plans to move In-Yan Sa to Wakan Tipi. Wolfchild announced the elders support at a meeting of Dakota elders and allies on Saturday at All My Relations Gallery. In-Yan Sa used to reside near the Mississippi River near the Dakota village of Kaposia. United Methodist missionaries took the rock after the Dakota-U.S. War of 1862. The rock became a symbol of their church camps. The rock now sits outside Newport United Methodist Church, and calls have been growing from Dakota people for its return. Sign next to In-Yan Sha in front of Newport United Methodist Church. 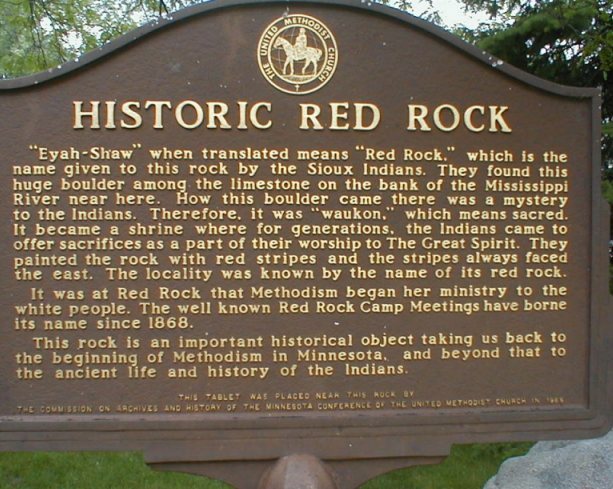 On Saturday, May 13, Dakota traditional spiritual elders will gather to discuss the return of In-Yan Sha (the sacred Red Rock) to the Dakota people. The meeting will include a discussion of In-Yan Sha’s history and an announcement of the sacred site where the elders would like In-Yan Sha placed. This meeting will be open to the public with limited seating. It will take place from 1:30 – 5:00 p.m. at All My Relations Gallery, 1414 East Franklin Ave., Minneapolis. Those are welcome who come with a good heart, and with respect for the elders, In-Yan Sha, and Dakota sacred sites. In-Yan Sha is connected to the Dakota origin story. Methodist settlers took the rock in the 1800s; it became a symbol for the Methodist church camp. 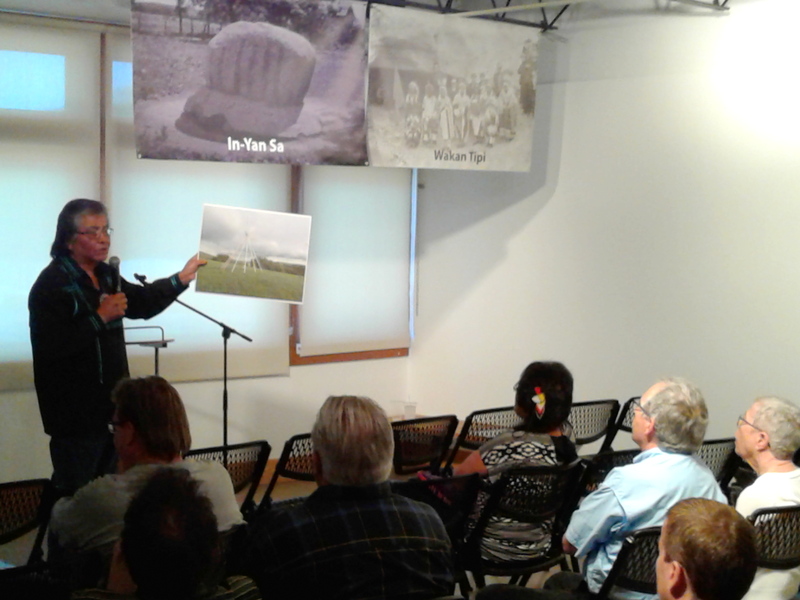 The seizure of the Red Rock is one symbol of how settler culture tried to assimilate and erase Dakota culture and religion. The rock has moved several times, and now resides in front of the Newport United Methodist Church (UMC). Bishop Bruce R. Ough of the UMC Minnesota Conference has expressed his interest in returning the rock; efforts have started to do this healing work in a good way.